Import permits and forms to file, 30 day quarantine, numerous vaccinations, and the horror stories of individuals being charged outrageous import fees with the looming threat of their pets being taken to quarantine. 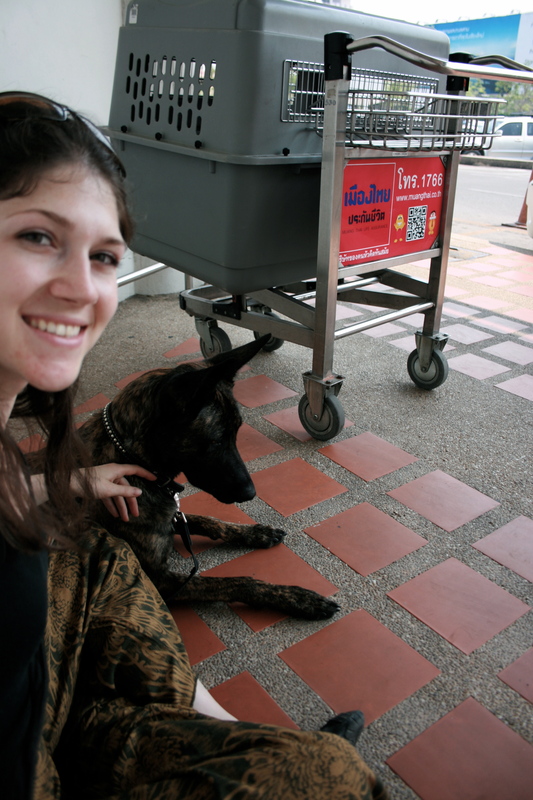 Traveling to Thailand with a dog is easier than it looks. The most accurate source for Thai import/export is the Thailand Department of Livestock Development website found here. Whether you are arriving from the United States, Canada, or the European Union the requirements are the same. Health Certificate, in English, authorized by the veterinary official of the exporting country. Rabies Vaccination no less than 21 days prior to departure. Leptospirosis Vaccination no less than 21 days prior to departure or a negative test result within the 30 days prior to departure (Leptospirosis is combined with the Rabies vaccine given in France). Distemper, Hepatitis, and Parvovirus Vaccinations no less than 21 days prior to departure (normally these are already completed during puppyhood). 30 day quarantine at owners expense (not enforced). If your dog is not allowed as carry-on, find an airline that will allow pets as checked luggage instead of cargo. Cargo fees can add up fast on a long distance trip to Thailand if coming from the United States or in my case, Paris. I have talked to several individuals who successfully flew via Thai Airways. They also paid close to $1000 for a medium-large sized dog. Air France, KLM, and Delta have teamed up, and they all have a flat rate of 200 EUR/CAD/USD for pets flying internationally as either carry-on or checked baggage. For those traveling with a large dog, this price can’t be beat. Our airline of choice this trip was Air France because they run direct flights regularly from Paris to Bangkok. For those interested in taking a dog through Paris CDG airport, see my article on the topic here. After you have gotten through customs for bipeds at Bangkok Suvarnabhumi Airport (the lines can be quite long), pets that did not fly as carry-on will be at Z3 Oversized Baggage. Directly across from the oversized baggage claim is an exchange booth. I advise you take a moment to exchange some cash to help speed up the next few steps required to import your pet. There are two offices for animal customs in the Suvarnabhumi Airport, both are located at opposite ends by baggage claim 9 and 10. The primary office is located on the same wall as the oversized baggage claim. I was met by three stern faced officials. Remember this is Thailand. Smile. I gave them a cautious smile and a respectful nod, and their faces lit up. Contrary to numerous sources on the internet, all paperwork can be done upon arrival in Thailand. I did fill out my Form No 1/1 in advance to save time (I had a connecting flight to Chiang Mai to catch!). None of these individuals seemed able to speak English, but I continued to throw beaming smiles in their direction, and they bustled through my paperwork. I was given three different forms requiring my signature, and I was asked for Zala’s health certificate. In the European Union, health certificates are filled out inside of the pet passports. Ask your veterinarian to print a separate health certificate form, these officials were not familiar with pet passports. The process may have taken 15 minutes, I paid a 100baht fee, and Zala’s vaccinations weren’t even checked! The next step was to walk across to customs for bipeds with Zala’s two freshly stamped pieces of paper authorizing her entry into the country of Thailand. The customs official immediately demanded 1000baht from me. When I asked why, a finger was pointed to Zala’s paperwork and I received a look of exasperation. Afterwards, I researched what this fee is based off of, and this is what I found from the Thai DLD website. The officials get to make up the import fee. Remember to smile, this fee can be dodged if you wish and this information can be found on the Thai DLD website, but 1000baht is roughly 30USD, not worth fighting in my opinion. And that’s it! Welcome to Thailand. Wow – well this is pretty much the most detailed and helpful run-through I think I’ve ever read on the subject. This will definitely be of exceptional help to other expats and travellers considering taking their “best friend” to Thailand with them. Thank you so much for this! I’m relocating from Beijing to Phuket in the next couple of weeks, and this article really calmed me about the whole process. I’m bringing two dogs though, and I’m a little concerned that I can only leave China with one per passport. Gah! Good luck! I looked into bringing my dog to China and the regulations are complex there, especially for a large dog. Let me know how things turn out in Phuket. Phuket, in my opinion, is the most pet friendly part of Thailand. A good place to get a help and info is Thailand Canine Academy. They are in the Phuket area and were helpful when I for starting my research to move to Thailand. I can’t find where to get the import permit. My vet needs this to send to DC for approval. I do not understand. Are you importing your pet to Thailand? You would not need to send an import permit to DC. If you are talking about your pet’s health certificate, that needs to be approved by the Department of Agriculture and should be provided by your veterinarian. Thank you so much! I had read from other travelers that the paperwork could be done on arrival but everyone else (including the vet) said, “Thailand is terribly strict and you should apply for import permit 2 weeks ahead,” but didn’t seem to actually know the process. Your article is exactly what I was looking for and knowing what to expect gives me great peace of mind that my Little Bear will be safe. 🙂 Happy New Year to you and Zala! Be well! Great resource!! My biggest question has been if we will be allowed to see/ take our dog out to relieve himself etc. during our 3.5 hour layover in South Korea. were you able to? Sorry, but if your dog flies as “checked luggage” or “cargo” then they cannot. You would have to export in South Korea then import- so to speak. If you have a small dog traveling as “carry on luggage”, that is a different story. Hi, I have some questions about how it´s really working at the airport. I m going to fly with KLM from Stockholm to Amsterdam, have one night stop over and then the next day go from Amsterdam to Schiphol. I have all information about vaccin and paperwork, but still…I m so scared for what´s gonna happend at the airport i BKK. My dog is flying with me as checked in luggage. What shall I do at the airport? Where do I pick my dog up? Is it at the claim where the bags are? Why did you have to pay import fee for your dog? I cant find these paper you wrote about, the website is not working and they dont respond to mail either. How was the trip for your dog? Stressfull? Dear Camilla, did you flight allready to BKK with your dog, how was it going ? Hi, could you please update the link for No 1/1 form? Hopefully it is not me but it’s not working. I have a lab that is about 130 lbs. that has been with me for almost 13 years now. Does anyone know if you can fly a dog into Chiang Mai International Airport? We live in Yangon and I want to bring him to a dog trainer in Chiang Mai for 6-7 weeks this summer. We also have to go home for our wedding, and we can’t leave him in Yangon with our housekeeper this summer because our employer is switching our housing assignment. Bangkok Airways checked the flight from Yangon to Chiang Mai and said that they can take him, at his size, on that nonstop flight, but I haven’t read anything about an animal and livestock office at the airport there. Want to be sure before I book tickets. I can always fly him to Bangkok, do the paperwork there, and then take the train or fly him again the next day, but I really want to avoid having connecting flights and keep it safe, short, and as stress free for him as possible. Any answers or advice? This couple took their dog to Thailand from the UK, and they imported their dog in Chiang Mai. hi there, did you ever achieve this? I am in the exact same predicament and need to know if I can bring him in through CHiang mai. Thanks! Yes I did. I imported my dog in Bangkok. 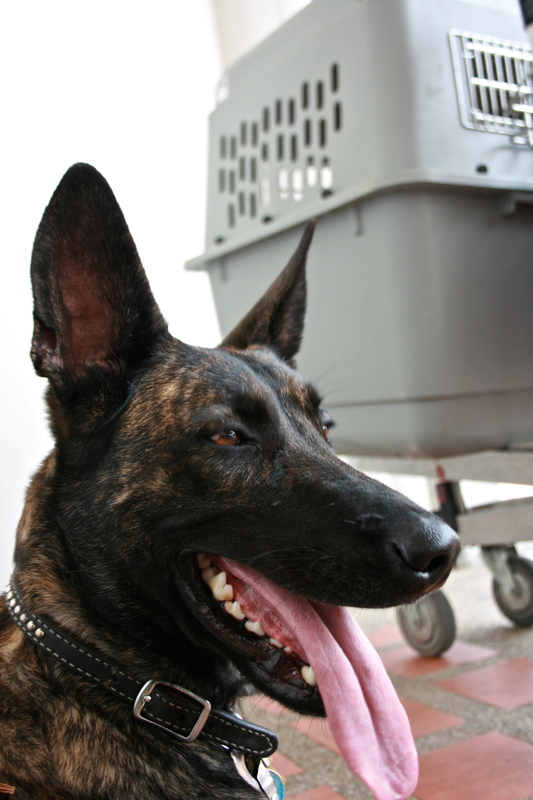 I was able to get a taxi in Chiang Mai to take my dog (crated). Finding housing was difficult but I rented a room at CMstay. They’re on facebook. P.S. How are you surviving in Thailand? Nervous about the weather? I was there years ago, and it was sooo beautiful! Thank you for all your blog information! Do you have any experience crossing the Thai border via land? We will come across from Cambodia to catch a flight in BKK. Very good information, I am nearing retirement and my wife and I have thought of moving to Thailand (Chiang Mai area) when I retire in 2 years. We have been there several times. We have a 75lb Doberman who is similar in size to your dog. Our dog is very calm and friendly. We have really been struggling with the reality of bringing him with us or not going at all, this article has releived a lot of that anxiety. My plan is to go over a few months in advance to find a house to rent and buy a decent used car for us there (an SUV). My plan would be then to drive down to BKK and meet my wife at Swampy with the dog as they arrive from the US, then after one day rest in BKK, all of us drive up to Chiang Mai. I have never paid attention while I was there, but is there a designated area at Suvarnabhumi to take the dog outside to relieve himself once they get off the plane there? Do you have any other tips regarding a large dog in BKK? I was thinking finding a hotel that would allow us to have him in the room might be a challenge. This post is awesome! I’m taking my dog to Thailand Saturday and getting a little nervous because I didn’t get an import permit or contact them in advance. I have all the shots and the health certificate though. Any opinion? I’m flying from the US (Boston) to Bangkok, but I’m being told that I need to use a pet shipper. I called Delta and they told me I would not be allowed to fly with my dog as checked baggage, and they told me to contact a pet shipper. I have called several other airlines and they have also referred me to pet shippers. I have received some quotes from various pet shippers, but they are extremely expensive. I don’t recall any restrictions on Dobermans. I am having trouble booking a flight from BKK to CNX (Chaing Mai) what airline did you use? I used Thai Airways. They were great! Just collected my 2 cats at Bangkok came by cargo from Dublin. Never again. It took 6 hours from time of landing to collection. a lot of walking between 4 different buildings and 500 Euro in customs fees, tax, insurance etc. Best to travel with your pets is at all possible. Same problems going to London too but a bi cheaper and more efficient. Hello and thankyou for this. I will be bringing my pet from Canada to Phuket. Any idea how to obtain the necessary forms to save time as you mentioned. the link isn’t working. Hey I’m looking to move to Thai land with my fiancé and we have two large dogs a lab X and a husky X. We would be importing them from Canada- they weigh about 100lb each. Was your dog okay on the flight? Are they treated well and is it cold for them? I’m trying to figure out how much this is all going to cost. How much a month does it roughly cost you living there? Thanks so much in advance. Some advice would be much appreciated. Also could you recommend some favourable areas to move to? Hi there. What a coincidence, my fiancée and I are also from Canada – Toronto and are also moving there this year . . .we’d like to go in August however some airlines won’t fly your dogs due to heat levels. Air Canada for example won’t fly them between June 30-Sept 10 I believe. We are about as stressed as we could be as we have a St. Bernard and really concerned about such a long trip. When are you going? I travelled with my dog in 2014. Airline requirements have changed since them, a few years back AirFrance, KLM, and Delta were my top picks for airlines. I am unsure about current regulations. I flew my dog in the spring so I did not have to content with heat level regulations. Hi, just responding to your emails that filled my inbox at Yahoo account. I’m very jealous and wondered how Mal from Dublin’s two cats are doing and if you had to mandatorily quarantine them before and how old were they? Are you lucky travelers or Thai relocators staying there permanently? From Canada, travelling with a pet to Thai or anywhere seems to be a bureaucratic nightmare and I was told by my vet that it would take up to 2 years to get the shots and follow the legal procedures to get approval to take my cat anywhere. Did you guys have to get pet friendly accom before heading to Thailand? Be careful in Thai, although beautiful I had a few close calls there, not from the local food, I don’t think, but from going out with fellow backpackers and the spending the next days bed ridden delirious and unable to breath, had to get Cipro from local airport doctor. Take care of yourselves and your pets. I’m flying my 75 lb black lab from Texas to Thailand (he and I are moving there) and it’s been so stressful trying to find an airline (and partner airline) who’ll transport such a large dog for such a long amount of time, without insane fees and layovers, where he’d be unable to be released to me. Any advice or tips you’d have would be greatly appreciated!! It has been several years since I’ve flown a dog so I am a little out of date with current airline policies. Weigh your crate and know what your overall combined weight will be. There is a weight cut off with several airlines that require you to fly via cargo (avoid flying cargo if at all possible), and your dog plus crate might be cutting it close. I presume you have been looking into all options to fly from the west coast to Thailand. Look into just buying a direct flight from a major airport like LAX or SEA and either drive or buy your own separate connecting tickets to get there. Also, a wild card idea but bear with me…direct flights from NYC to Paris CDG are cheap. Flights from Paris CDG to Bangkok BKK are also quite cheap. France has easier importation requirements. This is definitely the lonnggg way around the world but remember to look outside the box. I’ll keep mulling it over in my head and let you know if I come up with any other ideas. Love this post, thanks for all the info! I am planning to go to Thailand and don’t go without our dog, she is not big but also not too small… she has 8,5k then think she needs to go as cargo as well. I have some doubts, have you experienced travel between the countries there? Laos, Cambodia, Indonesia, Malaysia, etc? We are thinking stay between 1 month and 3 in each place…. also because of visa restrictions. Do you think this is something possible? I’m travelling from Qatar to Krabi, Thailand next month. My very small dog will be carry-on. Do I need to apply for an import permit from the Thai government or is that only when the dog is in cargo? Also, Krabi has an international airport – would I go through the animal customs process there or does it have to be at a certain airport? It has been several years since I have imported my dog to Thailand so bear in mind rules can and will change over time. That being said…I printed the form off online, and filled it out. I had this document in hand when I arrived at the airport to hand over. This should not change regardless of having a dog as carry on or in the cab. I do not know anything about Krabi, but if it is an international airport then it should have the ability to import an animal.